This is the first (and in my opinion, the best) of the three Sabbath tribute albums of 1994. The other two are death-metal type stuff, and Death Metal bites hard. This is far more listenable. Bullring Brummies is Geezer Butler, Bill Ward, & Rob Halford. The two guitarists are Scott “Wino” Weinrich (sp?) from the band called The Obsessed, and Brian Tilse from the band fight. Additionally Jimmy Wood plays harmonica. The band was supposed to be the original Black Sabbath, but management and label politics caused that not to happen. Also, the fracas behind the scenes here lead to the breakup of the band after the Cross Purposes Tour. That tour ended with a band of Tony Martin / Geezer / Iommi / Bill Ward, they were supposed to record the next album. There was an apparent fight between Gloria Butler & Tony Iommi over this tribute album, and it caused ’em to split up again. The cover of Solitude appears only on some versions of the album, one of which is NOT the US domestic version. 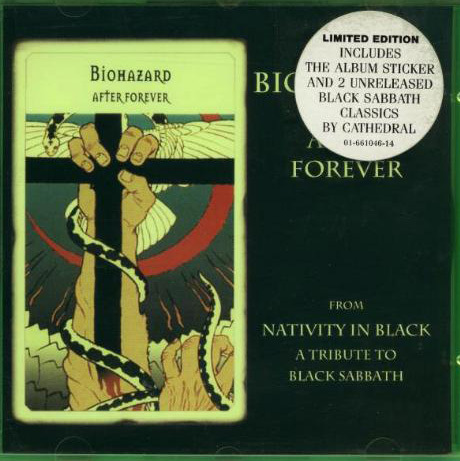 The CD single for Biohazard’s “After Forever” contains two other tracks which do not appear on another version of the album. They’re both by the band Cathedral, and they are “Wheels of Confusion”, and “St Vitus Dance”. This is the cover for the CD single for the Biohazard After Forever cover. Here is the video for “After Forever” by Bio Hazard. If this video does not work, please email me. Thanks. One of the “other” tribute albums features a cover of “Into the Void” by Exhorder. I’ve heard that Iommi likes that cover. On iTunes I have noticed that there are everal Black Sabbath “Tribute” albums. This includes covers by respectable bands (like the ones in this album) to bands looking to make a name for themselves, and the plain weird (ie Black Sabbath songs done in bluegrass, lounge act, and monk chant). I am wondering if you, or someone else you know, have taken the time to review these. I know iTunes usually does reviews – but they are often wrong. Finally, thank you for your hard work on this website. As a Black Sabbath fan for close to 30 years, I appreciate you keeping us all updated on the band as well as the projects of the various band members. Over the years I have often checked the site to find what is going on.